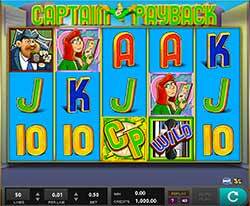 Captain Payback Slot by H5G - Play Free at Slotorama! Review of: Captain Payback Slot by H5G at Slotorama! It's a bird, it's a plane... no... it's Captain Payback and he's soaring in to deliver hot winnings to you! Get ready for an action-packed 5-reel 50-line video slot from High5Games that features a Superhero that is all about returns. Complete the Capture Bonus to win your chance at the Jackpot Bonus where rewards reach 1000x your total bet! It’s a bird, it’s a plane… no… it’s Captain Payback and he’s soaring in to deliver hot winnings to you! Get ready for an action-packed 5-reel 50-line video slot from High5Games that features a Superhero that is all about returns. Complete the Capture Bonus to win your chance at the Jackpot Bonus where rewards reach 1000x your total bet! This fun game isn’t your typical Superhero game like Superman or Batman. This caped crusader is focused more on helping you earn big rewards. Get bopping to the mysterious music while spinning the reels that offer an RTP of 96.5%. You can reach that payback and even higher by triggering one of the game’s fantastic bonus features. Wilds – The Wild symbol says “WILD” across it in green lettering and can appear on reels 2 and 3 only. It will substitute for all symbols in the game! Vertical Expanding Wilds Feature – Each Wild that appears on reels 2, 3 and 4 expands vertically and fills all positions on that reel. It can substitute for all symbols except the Lighting Bolt bonus trigger. Capture Bonus Initiation – During the Bonus Game, land 3 lightning bolt symbols in any position on reels 3, 4 and 5 to start the Capture Bonus which awards 5 free games. Jackpot Bonus Initiation – Capturing one of four crooks in the game in the Capture Bonus initiates the Jackpot Bonus. You capture these villains when three or more land in a line win on any line. The Jackpot bonus features 10 tiers with 1 through 9 having 5 pick options. Choose a criminal to reveal your reward which can be anywhere from 5x to 1000x your initial bet!